Our natural gas distribution system planning and installation services include polyethylene natural gas main and service installations including fused in polyethylene ball valves and welded connections to existing steel distribution systems for replacement projects. Gas Control Technologies Inc will meet, consult, plan and provide a detailed proposal including scope of project and associated project fees. 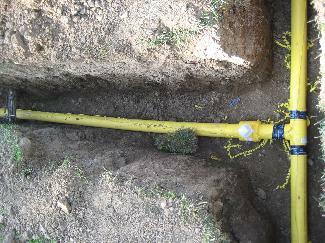 On the right: Example of welded connection to over depth main and installation of new main to depth of 30 inches of cover. Fused in polyethylene isolation ball valves for sectional control. Gas Control Technologies Inc installs any size rotary and turbine meter required for new metering applications or obsolete diaphragm meters, along with natural gas pressure reducing regulators either new or replacement due to obsolescence. 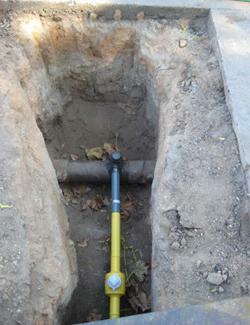 Currently, new or replacement meters are being installed to assist in cost recovery efforts. Gas Control Technologies can size meters applicable to facility gas consumption and also supply remote metering capability options for energy management personnel. We will coordinate all meter set installation and provide planning, shutdown impact/time frames, purging, gas handling and welding when required. We offer polyethylene ball valve installations to shutdown/isolate natural gas distribution at strategic locations causing minimal impact upon emergency or planned shutdowns. Fused in polyethylene ball valve installations eliminate threaded or flanged piping connections, a potential source of future leakage and corrosion/degradation. All natural gas valve installation projects include written impact, planning and shutdown time frame information to assist facility personnel. Gas Control Technologies can shut down existing steel natural gas systems or provide hot tap bypass installations providing no facility impact and then remove obsolete steel valves and replace with polyethylene ball valves. Any critical isolation valve whether frozen or inoperable can be replaced and upgraded to polyethylene ball valves. 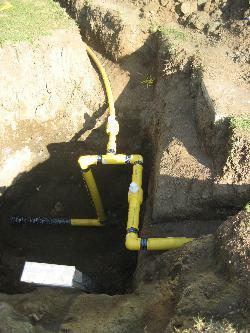 Top left: Example of 2 inch welded hot tap tee installed on 6 inch main. Benefits include no shutdown/facility impact and welded application on both tap fitting and transition fitting from steel to polyethylene leaving no threads or bushings, sources of future leakage. Note downstream 2 inch fused in PE ball valve.